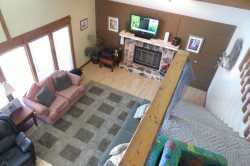 Osage Beach, MO / Lakeview / 3 Bedroom / 2 Bathroom Condo / Near Tan Tar A Resort. This is an awesome 3 Bedroom 2 Bath Breakwater Bay Condo offering a great Lakeview from the screened in porch. This condo has a very open floorplan with Lakeview throughout including the Master Suite which is appointed with a king bed and private bath. The second bedroom has a queen bed and the third bedroom offers twin bunk beds. This is a great condo for families as it is located one building away from the outdoor Lakeview swimming pool. The Breakwater Bay Condo Complex also offers Tennis Courts and is conveniently located near Tan Tar A’s / Margaritaville Resort. This complex is also located near other Lake Area attractions including Red Head Yacht Club, Shorty Pants Bar & Grill, The Oaks Golf Course, Big Surf Water Park and many others. There is also a PWC slip available with this condo so as you can see it offers something for everyone. Pack your bags, head on down and start enjoying all the lake has to offer! You can book this condo with confidence.